Like other top European city-break destinations such as London and Paris, Venice has a reputation for being pretty expensive. It’s true that if you’re not careful you could end up blowing half your budget on one meal — albeit, probably a very good one — but Venice certainly doesn’t have to be a bank breaker. Having spent a few days there recently, here are my top 5 recommendations for getting the most out of Venice on a budget. 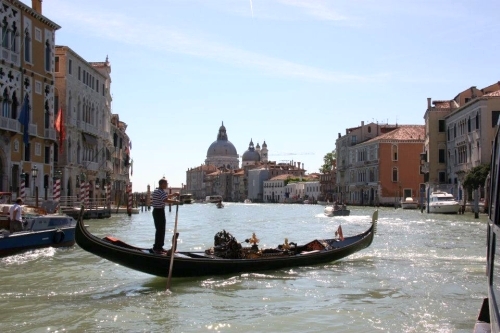 Historically, Venice’s iconic gondolas would have been used by pretty much everyone for getting around, but nowadays the price means they’re strictly for tourists. The current going rate for a 40-minute gondola ride is about USD$98. Water taxis (very plush speedboats) are similarly expensive. But, fear not, you can still experience the famous waterways of Venice. Simply do as the locals (and most non-locals) do, and hop on a vaporetto (water bus). You can get a single-journey ticket for USD$9, but best value is a travelcard — from USD$22 for 12 hours up to USD$61 for a full week. As well as enjoying views of the Grand Canal from the water, you can use the water buses to visit nearby islands such as Murano and Burano. These are both recommended, the first for its glass-making factories, the second for its pretty, brightly painted houses. 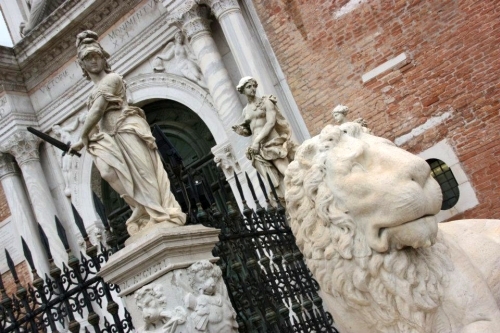 You can also get a vaporetto to San Michele, the city’s cemetery island. This holds interest for a number of reasons: grand tombs, famous names (such as Ezra Pound and Igor Stravinsky), row upon row of beautiful flowers and the fact that so many of the gravestones include a picture or photographic engraving of the departed — something I’d never seen before. One part of Venice you should definitely visit if you’re on a budget is, of course, the student quarter. The university buildings are spread out around the Dorsoduro area, one of Venice’s six sestieri (official areas), in the southwest of the city. There are some great cafes and bars here, which won’t charge an arm and a leg, especially if you do a bit of detective work and figure out where the students are heading (of course, you could obviously just ask them). If in doubt, head for Campo Santa Margarita, one of the city’s liveliest squares, especially after dark. 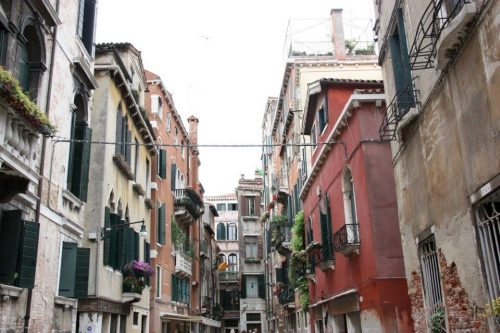 While waterways are what make Venice so distinctive, it’s actually a great city to see by foot. There are no cars or other motor vehicles, which makes the whole experience much more calm and relaxing than most cities. Due to space constraints, Venice itself has not been able to expand very far. So unless you somehow accidentally walk across one of the long road bridges connecting the city to the mainland, you can’t really end up too far away from wherever you need to get back to. And, having made a point of walking around as many different parts of the city as I could, I can report that it’s pretty much all beautiful. Even the bits that are run-down are decaying in a very charming way. Visiting churches may or may not be your thing, but if you appreciate architecture, you won’t want to miss out on exploring some of Venice’s numerous old churches — some huge, some small, all magnificent. Many are free to go inside (if they are, they’ll usually say so on a sign out front), and some even have free exhibitions. For example, I came across one church hosting a collection of historic musical instruments. If you do fancy wandering into a few churches, make sure you’re dressed appropriately. In general, Venice is very relaxed about clothing, but it’s best to be relatively well covered for the churches. When your belly starts growling, the easiest way to save yourself a few euros (or 50) is to get away from the main tourist traps, especially St. Mark’s Square and the Rialto Bridge. As soon as you walk just five minutes away from these areas, prices drop dramatically. Most restaurants have a menu displayed out front, usually with English translations and prices shown, so it’s easy to check. Many also have a fixed-price menu of two or three courses, which can work out to be good value. You can get something fairly decent for USD$18-25. Hunger satisfied, you can return to enjoy the ambiance of St. Mark’s Square free of charge. The restaurants around the square don’t seem to mind passers-by gathering to enjoy their live music shows without paying for a table. For smaller meals, there are lots of little cafes where you can order a sandwich or pizza very cheaply, or stop into the many bars where bar snacks (cicheti) start from a few euros each. If you keep your eyes peeled, you’ll also find a few supermarkets dotted around, where you can stock up on drinks and snacks at a low cost. Obviously, if you’re going all the way to Venice, you don’t want to spend the whole time hunting for supermarkets and avoiding St. Mark’s Square. There are definitely some things it’s worth opening your wallet for. In my case, I was really glad I decided to pay for entry to a few art galleries. Venice has some really fantastic ones, such as the Gallerie dell’Accademia (pre-19th century art), Peggy Guggenheim Collection (20th century art from Pollock to Picasso, in the heiress’s former home) and the Museo Correr (hosting a Klimt exhibition when I visited). Consider booking your flights and hotel together. There are some good package deals available, with lots of two or three star hotels very close to the center. Don’t be tricked into booking an expensive coach or taxi from the airport to the center. There are cheap bus services connecting with most incoming flights. Look out for the ATVO or ACTV desk in the arrivals area when you land. Finally, even if you are on a fairly tight budget as I was, you’ll still end up feeling as if you’ve had a luxury getaway simply because the views are so stunning. I felt like I was walking around inside a beautiful painting most of the time I was there. So, enjoy, explore, and remember there’s a Venice for all — or at least most — budgets! Based in London, UK, Laura writes about student experiences in different countries for Top Universities, and covers women’s rights issues for Women’s Views on News. She loves London but tries to get out of it as often as possible.